Q: What did the peanut butter say to the bread? Explanation: When you grind up peanuts, you get peanut butter. 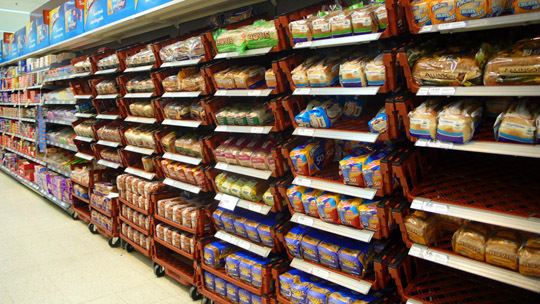 Bread that you buy at the grocery store, in the United States, mostly comes in a loaf; it is called a loaf of bread. Loafing around means to be lazy and not do anything. This joke is funny for a few reasons: first, it is funny because the peanut butter is talking; second, it is funny because the peanut butter is telling the bread, a loaf of bread, to stop loafing around, stop just sitting there. This joke is playing with the word loaf. Come back tomorrow to see how the bread responds! This entry was posted in Education, ELL, ESL, humor, Joke, jokes, jokes explained, kids jokes, reading, writing and tagged bread, ELL, English, ESL, food, funny, humor, joke, jokes, kids, kids jokes, loaf, loafing, peanut butter, reading, writing. Bookmark the permalink.